“X” Is For… Well, X (82/365 year 3) – Annoyingly Boring? Saturday, April 25. Last day in Disney. I had my camera for the first stop of the day, Animal Kingdom, and pressed the shutter release over 230 times in the course of just 20 minutes or so when we went on the safari ride. For the rest of the time though I wanted to focus on the day, not the shots so I didn’t bring my camera to Epcot for the second part of the day. 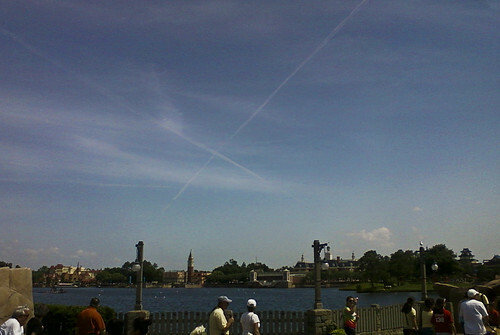 I was fully prepared to not have an “X”, when my daughter pointed out to me that there were crossing contrails over the World Showcase Lagoon! I asked my son for his phone, it takes better photos than mine and snapped the shot. I have many more Disney photos that I still need to upload, but wanted to try to catch up on my 365 so, if you are waiting for more photos to show up, bear with me.